Dorm Co. Tip: Be preventative and protect your dorm bedding from the start! 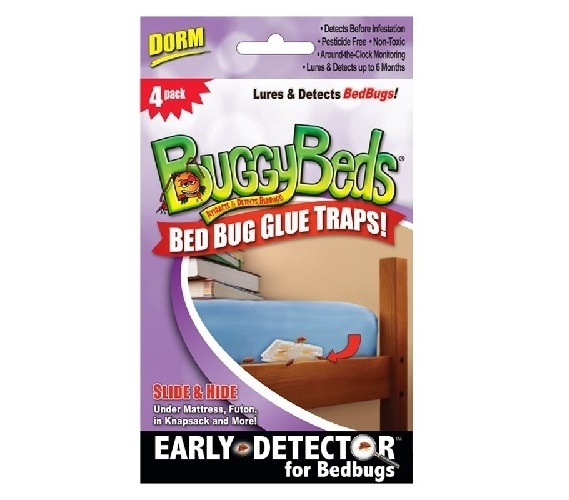 Our Buggy Bed - Bed Bug Glue Traps are the best and easiest way to know if you have a bed bug problem. Why wonder or worry if the bed you are sleeping on is infested with bed bugs? Instead of waiting until you get actual bed bug bites, set-up our dorm essential Bed Bug Glue Traps and stop a bed bug problem before it starts. Each Bed Bug Glue Trap pack set comes with four units. That way you can stick one glue trap at each end of your Twin XL Bed and protect your dorm bedding from move in day. Most college dorm supplies are fun, yet others like our Buggy Bed - Bed Bug Glue Traps are meant to give you peace of mind in order to be able to have fun. With so many students coming in and out of the dorms, it is certainly not a surprise or uncommon for a residence hall to get hit with an outbreak of bed bugs. Stay in the know with our Buggy Bed - Bed Bug Glue Traps! These alert systems go under your dorm bedding and provide a place that bed bugs can't resist going. Our Buggy Bed - Bed Bug Glue Traps are also pesticide free and non-toxic with a custom glue that attracts bed bugs, ants and any other insects. Of course, we do hope your dorm bed is college bed bug free, but it is always best to start college off right by being preventative.